Pocket charts for the classroom provide a fun, hands-on way to support instruction. The Essential: Gold Polka Dot pocket chart, embellished with metallic gold polka dots, measures 31” x 42” and features 10 clear pockets (31” x 1.5”) and 1 storage pocket (31” x 6”). This pocket chart for the classroom provides the perfect way to play games, teach sight words, and track behavior, while also providing an ideal complement to many classroom themes. Durable and flame-retardant, Carson-Dellosa's screen-printed pocket charts for the classroom help teachers create an engaging learning experience for their students. 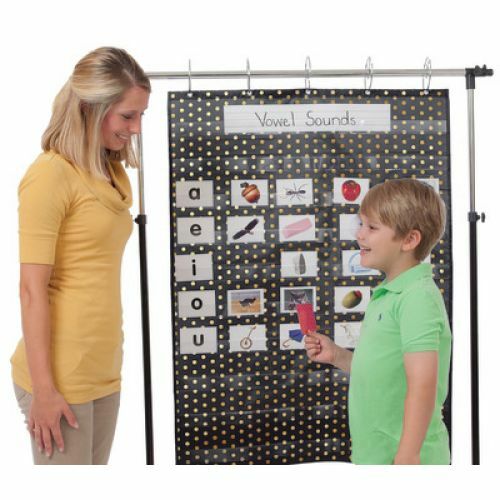 Whether you're teaching sight words or playing educational games, pocket charts are an ideal teaching tool for any classroom!